All the people who follow the stupendous game called football, do appreciate the fact that the upcoming FIFA 18 is about to showcase the football following fraternity, the magic created by the footballing Gods. Their magic, their touch and their sheer world class game which made the crowd come up to their feet will now be re-created in the game. The game includes many legends with the legend between the sticks being Lev Yashin. Lev Ivanovich Yashin. The Russian goal keeper nicknamed the “Black Panther” is considered to be the greatest ever to grace the football pitch as a goal keeper. Lev Yashin was a keeper who is known to have revolutionized the gameplay method of keepers. Standing between the goals in all-black attire from head to toe, which earned him his nickname, Yashin was the “one” who was the first to ascertain his authority and control his defenders as a keeper during his game days. He would often come off his line in one on one situations. Although, some may think that it is very certain and obvious in today’s game for keepers to do that, one must see that Yashin had been playing in the time when keepers had a defined position i.e. between the two sticks saving the goal without showing any skills with their feet. Nevertheless, one must grasp the point that when we consider all the major accomplishments of Yashin, he has won a gold medal at the 1956 Olympic football tournament, and has won the 1960 European Championship. He was also chosen in 1994, for FIFA World Cup All Time Team, and was also the shot stopper for World Team of the 20th Century. Yashin also is the only keeper to win the Ballon D’or in the year 1963. However, stepping into the 21st Century, Football has seen a drastic change. From the method of gameplay, to pitch standards, from the rules that govern the games to the football boots, jerseys and the very football itself. With this we can say that a new legend has also emerged and probably has the right to claim himself as the greatest ever to stop the ball from going into the nets. The following article depicts the journey of Iker Casillas from being a person who lost his family a huge sum of money to being arguably the best and perhaps the most complete keeper of all time. Yes, Casillas as a young child, had once forgot to post the football predictions by his father on the weekend. Rumour has it that all the 14 predictions were correct and his family lost out an estimated one million pounds. Iker Casillas Fernandez. The Saint. Captain of the most successful era of the Spanish team. Casillas is one of the most loyal footballers which has ever played for the Spanish Capital side, but alas was also subject to probably the worst seeing off from Madrid. Casillas was born in Mostoles, Spain on 20th May, 1981. He spent a part of his childhood in Navalacruz, town of his parents. This is the place where he and his parents found out that he had a keen interest in football and then it was decided by his father that he should join the Madrid outfit. Iker had always considered Madrid as his home town and he decided to tread on the path which his father advised him to take. Casillas joined the Real Madrid youth team at a mere age of 9, in the year of 1990. When Iker joined, the first team which he was part of in the youth side was “El Equipo Losada”. The first trophy which he won was the “Torneo Social” where in he had made many crucial saves and had kept a clean sheet as well. During the season 91/92 he had joined Alevin B but then after a month or two was promoted to Alevin A side. His major accomplishment then found a new high when he was part of the Junior B team of Real Madrid Club De Futbol, during the Season 93/94. It was in this season where he played his first ever International cup, the “Nike Premier Cup” after which he had signed his first professional contract with Nike regarding the Image licensing Agreement. During the season 95/96 he played and won his second International Cup, the “Mundalito de Bolivio”. 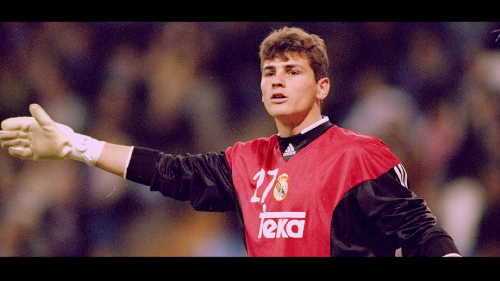 Casillas then debuted at age 16, for Real Madrid against Rosenberg in a Champions League match against Rosenberg, on 27th Nov, 1997. It was during this season that he debuted for Spain at U-17 level, still aged 16. He was the youngest player to feature in the squad, where Spain secured the third place in the 1997 U-17 World Cup, Egypt. After his stint with the Spanish youth outfit, Casillas was now promoted to the Real Madrid “C” team, during the season 98/99. It was this season where Casillas had a huge change of fortune during the season 98/99 as well as in the upcoming season, where many had identified the future talent, and Madrid had realized that they have a gem within their ranks. Dec 1, 1998 saw Casillas being called for his second Intercontinental Cup, and also he was now part of the Spain U-20. In the season 1999/2000, Casillas made debut for Real Madrid in the league, as well as debuted in the Copa Del Rey. Fortune was indeed with Casillas for that season when Casillas got a chance to play in the final of the Champions League when Madrid defeated Valencia 3–0, thereby making him the youngest player ever to appear in a CL final. It was that season when Casillas was awarded the “Trofeo Bravo” award. This award is given to the best European U-21 player and the previous winners of this award included legends like Van Basten, Guardiola, Del Pierro, Zidane. However, the evolution of Casillas from a child prodigy to a world class player occurred particularly in the season of 2001/2002 when Casillas won the Spanish Super Cup, the league title and was brought on as a substitute in the CL final when the then Madrid keeper got injured. Casillas had pulled off some excellent saves against a stubborn Bayern Leverkusen side. Yes, it was in this particular final where Zidane had scored the stunning volley. After this Casillas never saw back. Casillas was included in the World Cup squad of 2002, where he went on to make a spectacular save against South Korea which was considered by FIFA as the one of the top 10 saves to be ever made in the history of football. By the end of 03/04 season, Casillas had won his first UEFA Super Cup, second Spanish League, and second Inter Continental cup. It was in the year 2004, when Casillas for the first time experienced the authority of captainship when Spain’s newly appointed manager Luis Aranguez took over. This manager would be known for three major reasons. First, helping Spain wining the Euro 2008. Secondly, for introducing the “tiki-taka” system in the Spanish gameplay method. And thirdly, for benching once, experienced players like Raul and Michel Salgado. However, he had to bring back the experience for the Spanish squad. Casillas by this time was now the first choice for the Madrid side as well as for the Spanish outfit. He had suffered defeat by the hands of the French in the 2006 FIFA World Cup where the French, inspired by Zidane had defeated the Spaniards 3–1. The 06/07 season saw Casillas win his third league title. It was the period starting from 2007 season where Casillas went to define his prosperous era and maybe it is this particular era where one would go on to label him as the greatest keeper ever. The 07/08 season saw Iker win his fourth league. Such were the Madrid hierarchy impressed by their players that they decided to award life time contracts to Iker and Raul. They went on to sign contracts and thus Casillas was to stay in Madrid till 2017 by contract and upon signing the contract the buyout clause became a whopping 113 million pounds. During this time Iker was voted as the Fourth best player in the world, during the Ballon D’or nominations, losing his place in the top three to Cristiano Ronaldo, Lionel Messi and Fernando Torres. He was also considered as the third best goalkeeper of all time. Now, comes the Euro 2008. It was in this international competition that Iker was made captain, mainly because Raul had been dropped from the squad. Nevertheless, Iker captained his team to win the Euros. 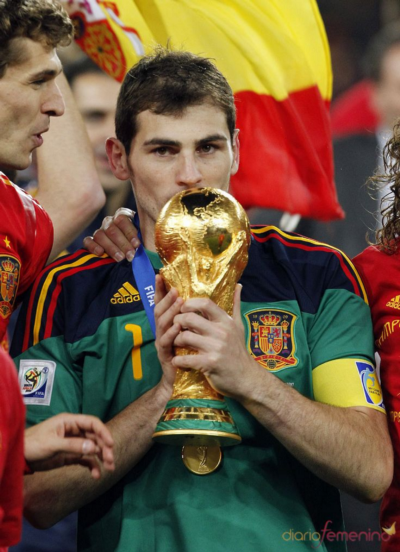 This was the only the second title won by Spain, making Iker the first goalkeeper captain to win the title. The start of the 08/09 season saw the phase where Iker had started to make personal landmarks. Not only in this season had he gone on to win his third Spanish cup he went on to create history. On February 2009, Casillas had equalled the record of playing 454 matches as a keeper for Madrid just at age of 27. It was also in this season that there were transfer rumours about Iker, when allegedly the newly rich Manchester City had offered a staggering 129 million to Real Madrid to avail the services of Iker Casillas. However, Casillas went on to say that he only wanted to play for Madrid. The saint however gained huge respect and applaud from the footballing world when in a match he went on to make a save which still keeps many in awe of his reflexes. In a particular match during the 09/10 season, against Sevilla where he made on to make a save which just showed his sheer class. Iker Casillas then went on to captain his side and won the World cup in the year 2010. He had made extraordinary saves and had gone to make an out of the world save when he denied Arjen Robben in a one on one duel in the final. He had also won the Adidas Golden Glove. The 10/11 season was when he won his first “Copa Del Rey” in a closely fought “El Clasico” finale. It was in this season where he was made captain of the Real Madrid side after Raul’s move to FC Schalke. In comes 2011/12 season. It was this season where Iker went on to etch his name in the history books. On a personal note as well as on a professional level he had gone to achieve everything possible. The season was fruitful for Casillas as he goes on to win his fifth league title. He had also acclaimed feats on an international stage. On November 12, 2011 Casillas played a record 127 matches for Spain. After the season, came the Euro 2012 where he captained Spain to their second Euro. While doing this, he became the first player for Spain with 100 international wins. He was the third ever goalkeeper captain to achieve this feat. He also broke the record set by Italian goalkeeping legend, Dino Zoff when he went on to not concede for 590 minutes in the Euros. Casillas went on to not concede for 817 minutes which was eventually broken by Olivier Giroud. By the end of 2012/13 season Iker had won his fourth Spanish cup. One of the highlights of this season, was when he was awarded the “Prince of Asturias” award along with Xavi for displaying remarkable sportsmanship spirit and proving the whole world that friendship and camaraderie came way above rivalries. 2013/14 season was probably the last fruitful season for Casillas with Madrid in which he captained them to a Copa Del Rey trophy, this being his second. It was played between the two greatest rivals, and one would like to recall the winner by Gareth Bale and his mesmerising run against a helpless Marc Batra. And it was on May 24, 2014 he went on to clinch his 3rd CL title. The famed La Decima. 2014 also saw Iker grab the UEFA Super Cup and the FIFA Club World Cup. This being the last trophy which Casillas were to win with Real Madrid. Iker Casillas was then subject to possibly the worst treatment with the Madrid hierarchy when he was subject to dirty politics and was then transferred to FC Porto. Casillas was in tears when he was told that he had to leave the all-white stripes. Many footballing legends, pundits and fans alike went on to criticize the harsh and disrespectful treatment given to Iker. Iker’s parents had further gone on to state that they wished that their son had rendered his services to Barcelona, where he would have got more respect and a respectful farewell as well. Casillas then moved to Porto where although he has not won many accolades, but he still went on to achieve personal landmarks. Currently, Iker Casillas holds the record for most number of Champions League appearance by any player, most number of clean sheets in the Champions League, a record 175 appearances across all UEFA club competitions. And has a personal record where he has kept a record consecutive 16 clean sheets. This brings us back to the question. Is he the most complete and successful keepers to have ever graced the football field? Yes indeed. His trophy cabinet and his personal achievements stand alibi to his credibility. However, as time and age got the better of him, a legend like him has not been shown the respect and given the stature which he should have been given. Iker Casillas still shows us that he still has the zeal and the charisma to achieve more. But by the time he decides to hang up his boots he would have broken many more records on all levels. Considering all that he has achieved and that he has showed the world what calibre he possesses, has the time come when the footballing fraternity has a change of thoughts and perceptions and considers “The saint” to be the greatest shot stopper of all time?? The post The Saint appeared first on El Arte Del Futbol. Where does Zidane go from here?